These replacement log sheets will help you save many hours of frustration whenever you find a cache that contains a messy wad of bad smelling paper that you don't even want to touch. Or maybe it's just getting a little damp in there and you want to be a responsible geocacher. 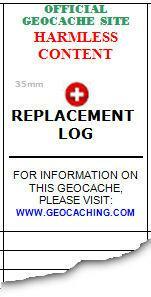 Either way, you can easily download and print these different sized replacement logs to always carry with you when you go geocaching. You will be a hero to the cache owner and to those who come along behind you. 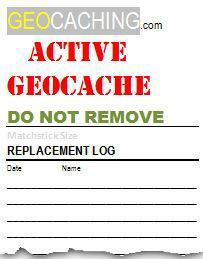 Listed below are documents, job aids, links and webpages that may be helpful to geocachers. Most of these relate to assisting with developing cache pages or manipulating cache data. Update Coordinates Here is a good Job Aid for updating your cache coordinates on the cache page, within the acceptable distance guidelines. To move a cache a distance that is outside of the acceptable range, requires a request to be submitted online to the reviewer.